Having studied human cognition formally as a student and also worked as a human factors and usability expert some folks have claimed I have an understanding of what makes good product design. My thinking on the aforementioned: I’m just a picky Italian and have high standards! A good cup of coffee is only as good as the freshness and quality of the beans, the grind, and the brewing process (filtered, and correct temperature, water is important as well). The Hario Slim Mill takes care of the grinding fresh coffee beans part and provides a very cheap and easy way to get espresso, drip, or French Press grinds. We load up the mill and crank for 1-2 minutes and get perfectly ground, and uniform, coffee (and for only $30.00 versus the $200.00+ for a decent electric burr grinder). We brew our coffee in a Clever Coffee Dripper which is essentially a non electric, one cup, drip coffee maker. The Clever Coffee Dripper takes a #4 paper filter and makes outstanding coffee (rivaling French Press and AeroPress Coffee). One of the best attributes of the device is it’s ease of use; specifically, the “clever” that releases your brewed coffee over your favorite mug (and “shuts off” when you lift the device off of the mug/cup). We consume our coffee in a Bodum Bistro Glass Mug which is made of high quality double insulated glass that keeps drip style coffee at the perfect temperature (especially in relation to a standard ceramic or porcelain coffee mug). The above products have dramatically improved our coffee drinking experience at home and I can’t imagine getting a better, single, cup of standard drip coffee anywhere else (and for under $60.00, not including freshly roasted beans). Note: we linked all three of the products to an online coffee shop called Sweet Maria’s for one reason, viz., they only carry the best coffee products (great idea, hugh!?). We don’t have any relationship with Sweet Maria’s but we like citing good companies (you can, of course, find the products for less via Amazon but it’s nice to support quality online shops). What you have described and photographed is an excellent and affordable way to make outstanding coffee (assuming good quality, recently roasted beans, good water at the right temperature, etc. as you said). A single pour over cup of coffee brewed in similar fashion in NYC would cost you around $12, give or take a couple of bucks, so after your 5th cup, your gear has paid for itself. The Hario grinder is also excellent for travel (yes, I take my beans and grinder with me, along with a travel electric kettle and a press pot thermal mug). 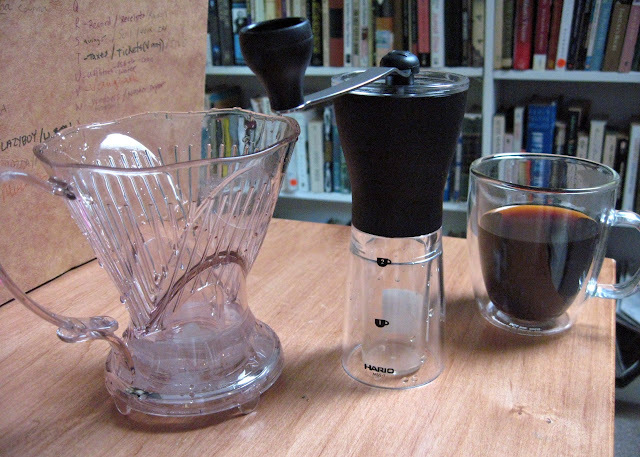 The Clever coffee dripper can do a pretty good job for up to about 15 oz of coffee. With any paper filter method, it’s good to pre-wet the filter to avoid a paper taste to your brew. Also good to run some hot water through the CCD and your mug before brewing so that your hot water doesn’t lose it’s temperature during brewing or cool off too quickly when emptied into your mug. The Hario costs about the same as an electric blade grinder, yet performs 100 times better, is quieter, and despite requiring a little elbow grease provides an enjoyable Zen-like experience as you grind manually. Even the acoustics of the slow hand-driven grind are rather pleasant. Thanks for the comment, Dr. K. Yes, we love the “Zen-like” experience in grinding, by hand, via the Hario (acoustics and feel)! Great tips on pre-heating all the equipment.